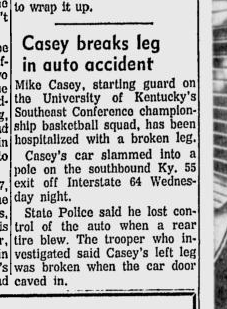 Well, we'll just have to root for Shelbyville's Mike Casey in his recovery and see what happens. 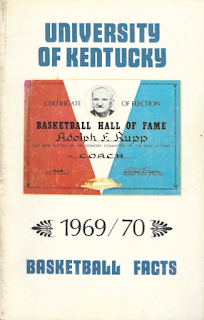 The cover pictures on this season's Basketball Facts capture two historic moments in the history of the University of Kentucky and collegiate basketball. First, the front cover contains a picture of a Naismith Memorial Basketball Hall of Fame plaque presented Wildcat coach Adolph Rupp during induction ceremonies last April in Springfield, Mass. The "Baron of Basketball" has forged an amazing record of 810 victories and only 175 defeats during 39 years as head coach of the Wildcats and ranks as undisputed winning coach of all time. His victories form the bulk of the cause for cake-blowing as displayed on the back cover. 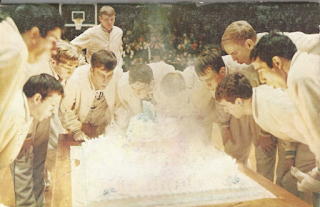 The Wildcats, fresh from an 88-67 victory over Florida Jan. 11, 1969, in Memorial Coliseum, were feted for becoming the first collegiate basketball team to reach the magic Victory No. 1,000 mark. According to UK count, the feat had been accomplished five days earlier, when Rupp's forces blasted Mississippi State, 91-72, at Starkville. A small cake ceremony was held in the Wildcats' motel headquarters after that game, but the big blowout came after the Florida game, when players representing the different century victory milestones were special guests of honor. The Wildcat claim to 1,000 games against "legitimate" competition had one drawback. The National Collegiate Athletic Association, which had sent Rupp's forces to an International Tournament in Tel Aviv in August, 1966, refused to recognize the Wildcats' five victories en route to the championship. Hooray for jmuddcat of YouTube, Google, the Associated Press, thekentuckytraders of eBay, Kentucky Digital Library, the Internet and Christmas! And go, 1969-70 UK! Kentucky is 16-1 as of Feb. 6, 1970, two games ago having been beaten for the first time this season--by Vanderbilt. Dan Issel has been slowed by a bruised heel, and his backup, Mark Soderbergh, is sick. 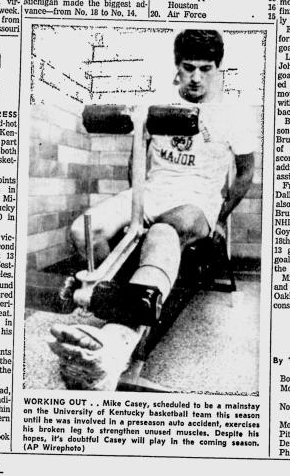 The Wildcats barely got by Auburn, 84-83, in their most recent game, and then a starting forward, Larry Steele, probably broke a bone in his right hand in a scrimmage back in Lexington. 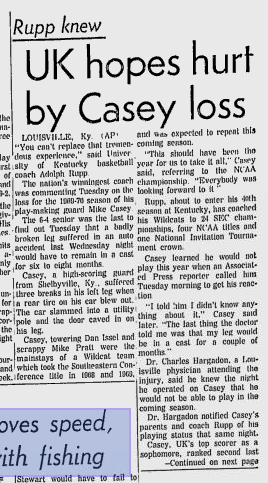 Adolph Rupp, as quoted by the AP: "How much does a man have to take? First it was Casey, then Issel and now Steele. I guess all that can happen now is for Mike Pratt to get hurt and we're completely finished." Cecil Herndon, in Hopkinsville's Kentucky New Era, by the way, had a column this week in 1970 that Rupp had a graduate student, Wally Dryden, chart a bunch of stats about Tennessee's possessions in the Vols-Wildcats game in Lexington in January. Ray Mears has been saying that its Tennessee's defense that has been holding down the scores of its games. Rump, in Herndon's column: "I get so tired of reading about disciplined ball clubs--as if we have a bunch of thugs out there who throw the ball around as they please." Dryden's records-keeping showed that Tennessee possessed the ball 27 minutes, 4 seconds, compared to Kentucky's 12 minutes, 56 seconds. Tennessee attempted a shot every 43 seconds and made a bucket every 1 minutes, 23 seconds; Kentucky: 23 seconds per each attempt and 35 seconds per each make. Herndon also reported that Dryden had Tennessee point guard Jimmy England maintained possession for more than 16 minutes himself and dribbled the ball 2,079 times. Rupp: "What were the other four players doing that other 30 seconds each time down?"